One of the most-known valuable tools for real estate marketing is the floor plan. This is preferred mostly by buyers to view the entire layout of a property and can give an estimate on the size of a home and its room sizes. A pre-inspection floor plan can help buyers understand the property flow and envision how to work with the spaces. A post-inspection floor plan is a detailed layout allowing buyers to imagine living in the home themselves outlining furniture placements. Including a floor plan on your ad will generate more interest from buyers, increase the number of inspection and beat competition. It is important to choose the right floor plan that will best emphasize your home’s distinctive features. A basic floor plan is usually drawn in black and white. If you would like to grab attention from your target clients, you may try using a colored plan. A textured plan is also great when displaying a home’s inner and outer surfaces such as tiles or decking. A plan may also include furniture to give buyers the idea of possible furniture positions. Site plans on larger properties are ideal when showcasing gardens or grounds, large blocks, sub-division potential or multiple dwellings including important external features and outbuildings. The most stylish of all plans is the 3D artist impression which generates detailed building plans used for bringing out properties yet to be built into life in a highly realistic fashion. 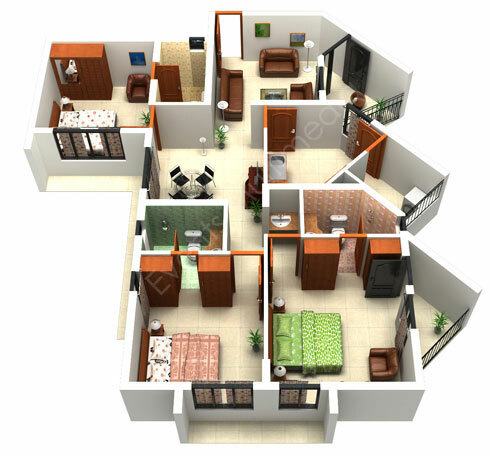 An effective way to combine your photographs and floor plans is through an online interactive floor plan. Symbols on the plan indicate the angle a photo was taken from, allowing buyers to easily navigate through a home by clicking on each photo, giving them a great feel for its flow and layout.